Somehow I missed this post in March. Multi-Tenancy is something which regularly comes up in our conversations with ISVs as they consider the move to SaaS (and ultimately for some, a SaaS solution running on the Windows Azure PaaS). I welcome any technology which can be applied to simplify the creation of a multi-tenanted solution or at least offer new alternatives. Turns out SQL Azure Federations is just such a technology. Multi-tenant database model with federations allow you to dynamically adjust the number of tenants per database at any moment in time. Repartitioning command like SPLIT allow you to perform these operations without any downtime. Simply rolling multiple tenant into a single database, optimizes the management surface and allows batching of operations for higher efficiency. With federations you can connect through a single endpoint and don’t have to worry about connection pool fragmentation for your applications regular workload. SQL Azure’s gateway tier does the pooling for you. On the flip side, federations does not in v1 help with issues such as tenant data isolation and governance between tenants. SQL Azure Federations will be available later this year (2011) and are explained in detail over on the TechNet Wiki - SQL Azure Federations: Building Scalable, Elastic and Multi-tenant Database Solutions. For more details about SQL Azure Federations, see my Build Big-Data Apps in SQL Azure with Federation cover story for Visual Studio Magazine’s March 2011 issue. Well, readers, all good things must come to an end. This is part 5, the final part of my series where I’ve walked you through the tools, techniques and pieces of the Microsoft Cloud BI puzzle that you’ll need to start developing your own Microsoft BI solutions that are Cloud (mostly, perhaps a bit hybrid) BI solutions. We’ve talked about created data marts using Microsoft’s cloud database, SQL Azure, based off your large on-premises SQL Server data warehouse using SSIS or data synch. We’ve touched on creating analysis reports and dashboards with PowerPivot, SSRS and SQL Azure Reporting Services directly off that cloud data. And then we created some Azure-based dashboards and Web apps that used ASP.NET and Silverlight to present the business intelligence reports back to the user on a variety screens from PC to laptop to mobile devices. As promised, I am wrapping things up with a look into the future of Microsoft Cloud BI. I am going to break this look into the future into 3 bullet items: SQL Server Data Mining in the Cloud, BI 3.0: Social BI and Cloud BI in Denali. The Microsoft BI Labs team has been working on a project to put SQL Server data mining in the cloud. Click here to go to their home page and I also pasted a screenshot from one of the samples below. If you’ve ever used the SQL Server data mining add-in for Excel, then you’ll be familiar with this new lab tool. It has the same concept of importing data into an spreadsheet and then running one of the SQL Server data mining algorithms against your data for the purposes of finding key influencers, market basket, classifications, etc. This site is a great example of BI in the cloud and is experimental, so not all of the models that you come to expect from the Excel add-in are available from this glimpse into the future project. A very important set of use cases for Cloud BI has emerged around Social BI or BI 3.0. Some vendors are running with the concepts of Social BI 3.0, such as what Panorama is doing with their Necto product. Social collaboration and integration of social networking weaved directly into the business intelligence experience is a direction within the BI solution space that I am very excited by. We pioneered these efforts at Microsoft with the integration of SharePoint, PerformancePoint, SSRS and SQL Server where SharePoint is the key to BI 3.0 by leveraging the social collaboration capabilities of SharePoint. This is a natural progression from BI 2.0 which was pioneered by efforts like our Microsoft Enterprise Cube (MEC) project which brought interactive visualization through Silverlight to the existing out-of-the-box visualizations in PerformancePoint and SSRS together in SharePoint. Once social media took off as a natural part of life and enterprise collaboration, adding in that capability through SharePoint was a very easy and natural extension of BI 2.0, such as what Bart Czernicki described in his Silverlight for BI book. There are a couple of advances in Denali that have been announced recently that will help you on the road to Cloud BI with SQL Server. First, one of the most talked-about features in Denali is Project Crescent, which provides report authors with a fully browser-based Silverlight experience for report authoring. You could use that tool instead of the thick-client Report Builder tool. Also, the new DAC and data synch capabilities in both Azure and Denali will make it much easier to migrate on-premises databases to the cloud and to keep them synched-up. If you wish to implement the suggested architecture from this series of an EDW on-premises, then SQL Server Denali will help with your data warehouse by including columnstore indexes for your fact tables and you can then synch that data to SQL Azure data marts with data synch. Today we release as an eBook another SilverlightShow series: Producing and Consuming OData in a Silverlight and WP7 App by Michael Crump. This ebook collects the 3 parts of the series Producing and Consuming OData in a Silverlight and Windows Phone 7 Application together with slides and source code. Both the article series and the ebook will be soon updated to reflect the recent Mango updates. Everyone who purchased the ebook will be emailed the updated copy too. We'll be giving some eBooks for free in our next webinars and upcoming trainings, so stay tuned for our news and announcements on Twitter, Facebook and LinkedIn! In the SilverlightShow Ebook area you will find all available ebook listings! The Windows Azure Marketplace is an online marketplace to find, share, advertise, buy and sell building block components, premium data sets and finished applications. In this video, We will discuss how ISVs and Data Providers can leverage Windows Azure Marketplace to grow their business. You can hear how other ISVS are participating in Windows Azure Marketplace to drive new business. Sudhir’s session wasn’t included in my Worldwide Partners Conference 2011 Breakout Sessions in the Cloud Services Track list of 7/3/2011. This is pre-release documentation for the Windows Phone OS 7.1 development platform. To provide feedback on this documentation, click here. For the Windows Phone OS 7.0 developer documentation, click here. Persisting state in an application that uses the Open Data Protocol (OData) client library for Windows Phone requires that you use an instance of the DataServiceState class. For more information, see Open Data Protocol (OData) Client for Windows Phone. The examples in this topic show how to persist data service state for a single page in the page’s state dictionary when the OnNavigatingFrom(NavigatingCancelEventArgs) method is called, and then restore this data when OnNavigatedTo(NavigationEventArgs) is called. This demonstrates the basics of how to use the DataServiceState class to serialize objects to persist state and how to restore them. However, we recommend employing a Model-View-ViewModel (MVVM) design pattern for your multi-page data applications. When using MVVM, the data is stored in the application’s State dictionary in the Deactivated event handler method and is restored in the Activated event handler. In this case, the activation and deactivation should be performed by the ViewModel. 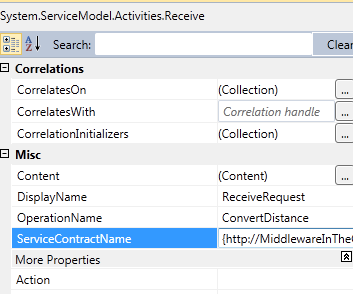 The examples in this topic extend the single-page application featured in How to: Consume an OData Service for Windows Phone. This application uses the Northwind sample data service that is published on the OData website. This sample data service is read-only; attempting to save changes will return an error. The following example shows how to serialize data service state and store it in the state dictionary for the page. This operation is performed in the OnNavigatingFrom(NavigatingCancelEventArgs) method for the page. // Serialize the data service data and store it in the page state. The following example shows how to restore data service state from the page’s state dictionary. This restore is performed from the OnNavigatedTo(NavigationEventArgs) method for the page. // Get the object data if it is not still loaded. // Try to get the serialized data service state. // Deserialize the DataServiceState object. // Set the context from the stored object. // Set the binding collections from the stored collection. // Use the returned data to load the page UI. // we need to reload it from the data service. Note that in this example, we must first check the isDataLoaded variable to determine whether the data is still active in memory, which can occur when the application is dormant but not terminated. If the data is not in memory, we first try to restore it from the state dictionary and call the version of the LoadData method that uses the stored data to bind to the UI. If the data is not stored in the state dictionary, we call the version of the LoadData method that gets the data from the data service; this is done the first time that the application is executed. This example shows the two LoadData method overloads that are called from the previous example. // Display data from the stored data context and binding collection. // Initialize the context and the binding collection. // Define a LINQ query that returns all customers. // Load the customers feed by executing the LINQ query. // Handle a paged data feed. // Set the data context of the list box control to the sample data. In this post, I am going to walk you through creating a very simple AppFabric Application that includes invoking a Workflow. Since I still don’t have access to the Labs environment(*hint Microsoft hint*) this demo will run in the local dev fabric. 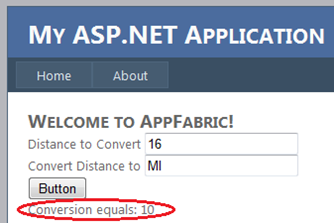 The first step is to create a new project in Visual Studio 2010 and select AppFabric Application. The User Interface for our application will be an ASP.Net Web App. In order to add this Web App we need to click on the Add New Service label which you can find in the Design View when you double click the App.cs file. Once the New Service dialog appears, we have the ability to select ASP.Net, provide a name for this application and then click OK. This purpose of this simple application is to convert kilometers to miles and vice versa. The Workflow will be used to determine which which calculation needs to take place i.e Miles –> Kilometers or Kilometers –> Miles. When we add our Workflow service we will see a Sequential Service Activity with our Request and Response activities. The first thing we are going to do is delete the existing data variable and add a few new ones. The first one is called DistanceValue which is of type System.Double and the second is called DistanceMeasurement and it is of type System.String. The final variable that we are going to set is called Result and will be used to return our converted result to our calling client. Next we are going to change our OperationName. We are going to set this to a value of ConvertDistance. Since the default service that is generated by Visual Studio includes a single input parameter, we need to make some changes by clicking on the View parameter… label. We want to set our input parameters to the variables that we previously created. Next, we want to perform some logic by adding an If activity. If the target DistanceMeasurement is equal to KM then we want to convert Miles to Kilometers otherwise we want to convert Kilometers to Miles. With our Workflow logic in place we now want to deal with returning our response to our client. In order to do so, we need to deal with our outbound parameters by clicking on the View parameter… label in our SendResponse activity. Once inside the Content Definition dialog, we can create a parameter called outResult and assign our variable Result to it. 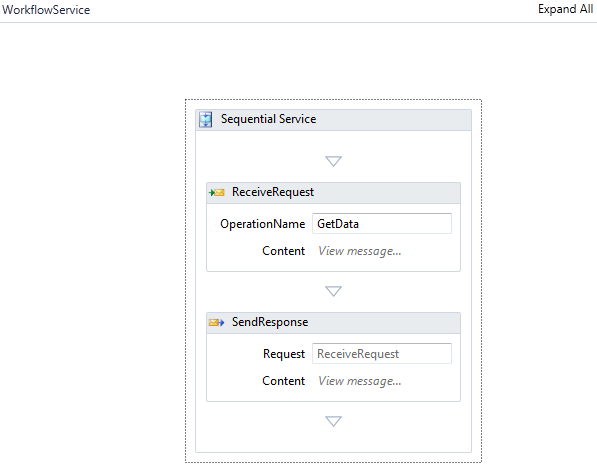 Since communication will occur with this Workflow via the AppFabric ServiceBus, we need to set our URI and related credentials. Before we can set a Service reference to our Workflow Service, we need to expose our endpoint. To do so we will pull down the no endpoints dropdown and select Add Endpoint. We can now select ConvertDistance and provide a suitable Name. With our endpoint set, we should be able to add a reference from our Web Application to our Workflow service. We no longer need to do this by right mouse clicking on Project References and selecting Add Service Reference. Instead we add a Service Reference from the Design View on our App.cs file. 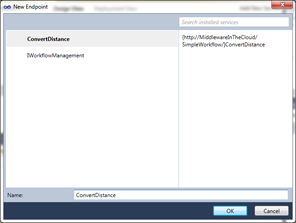 Once we have selected Add Service Reference, we should be prompted with our ConvertDistance Workflow service. Once added, we will now see a service reference called Import1. Now that our references are set we can take a look at our Diagram that Visual Studio has generated for us by right mouse clicking on our App.cs file and selecting View Diagram. Now we need to add an event handler for our btnSumbit button. Within this code we are instantiating a proxy object for our Workflow service and passing in values from our ASP.Net Web Form. We will then receive the result from our Workflow service and display it in a label control. With our application now built it is time to test it out. We will do so in the local development fabric and can load our Windows Azure compute emulator by typing CTRL + F5. It will take a few minutes but eventually our Web Form will be displayed in our browser. If we put in a value of 10 miles in our Distance to Convert field and click on our Button we will see that our workflow is called and returns a value of 16 Kilometers. Conversely, if we set our Convert Distance to field to MI we will convert 16 Kilometers to 10 miles. So as you can see wiring up Workflow services with ASP.Net web applications is pretty straight forward in AppFabric applications. Once I get access to the Labs environment I will continue this post with deploying and managing this application in the cloud. Kent is a a BizTalk MVP residing in Calgary, Alberta, Canada where he manages a couple teams focused on BizTalk middleware and IT Tools such as Exchange, OCS and System Center. The Windows Azure AppFabric team is on a bit of a roll. After releasing Service Bus Queues and Topics into CTP last month, the team has just released AppFabric Applications into CTP. Nominally, AppFabric Application simplifies the task of composing services into an application but, in practice, it appears to rewrite the meaning of platform-as-a-service (PaaS). The Windows Azure Platform has been the paradigm for PaaS. The platform supports various services such as ASP.NET websites in web roles, long running services in worker roles, highly-scalable storage services in the Windows Azure Storage Service, and relational database services in SQL Azure. However, the Windows Azure Platform does not provide direct support, other than at the API level, for integrating these various services into a composite application. With the introduction of AppFabric Applications, the Windows Azure Platform now provides direct support for the composition of various services into an application. It does this by modeling the various services and exposing, in a coherent form, the properties required to access them. This coherence allows for the creation of Visual Studio tooling supporting the simple composition of services and the provision of a Portal UI supporting the management of deployed applications. In AppFabric Applications, services are allocated to deployment containers which control the scalability of the services in them. Different containers can run different numbers of instances. These containers are hosted on the Windows Azure fabric. The services use that fabric in a multi-tenant fashion with, for example, instances of a stateless WCF service being injected into already deployed Windows Azure worker role instances. In classic Windows Azure, the developer must be aware of the distinction between roles and instances, and how an instance is deployed into a virtual machine (VM). This need vanishes in AppFabric Applications, where the developer need know only about services and need know nothing about how they are deployed onto Windows Azure role instances. The AppFabric Applications Manager runs on the AppFabric Labs Portal, and provides a nice UI allowing the management of applications throughout their deployment lifecycle. Unlike the regular Windows Azure Portal, the AppFabric Applications Manager provides direct access to application monitoring and tracing information. In future, it will also support changes to the configuration of the application and the services it comprises. The AppFabric team blog post announcing the Windows Azure AppFabric June CTP, which includes AppFabric Applications, describes how to request access to the CTP. Karandeep Anand and Jurgen Willis introduced AppFabric applications at Tech-Ed 11 (presentation, slides). Alan Smith has posted two good videos on AppFabric Applications – one is an introduction while the other shows how to use Service Bus Queues in an AppFabric Application. 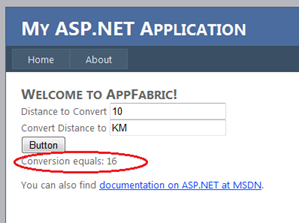 The MSDN documentation for AppFabric Applications is here. 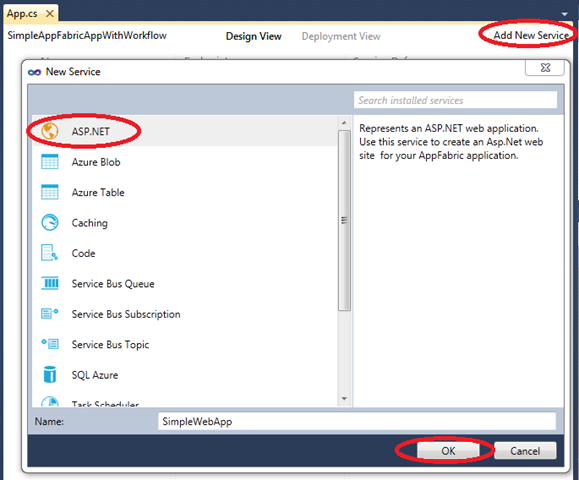 This post is the latest in a sequence of posts on various aspects of Windows Azure AppFabric. The earlier posts are on the Windows Azure AppFabric Caching service and Service Bus Queues and Topics. AppFabric Applications supports the deployment of composite applications to a Windows Azure datacenter. An application comprises one or more services, each of which is deployed into a Container (or Service Group) hosted by Windows Azure. The container is the scalability unit for deployments of AppFabric Applications. An application can have zero or more of each type of container, and each container can be deployed as one or more instances. A Code service is used to create long-running services in an AppFabric Application, and essentially provides the functionality of a worker role in classic Windows Azure. A WCF Service is a stateless WCF service. 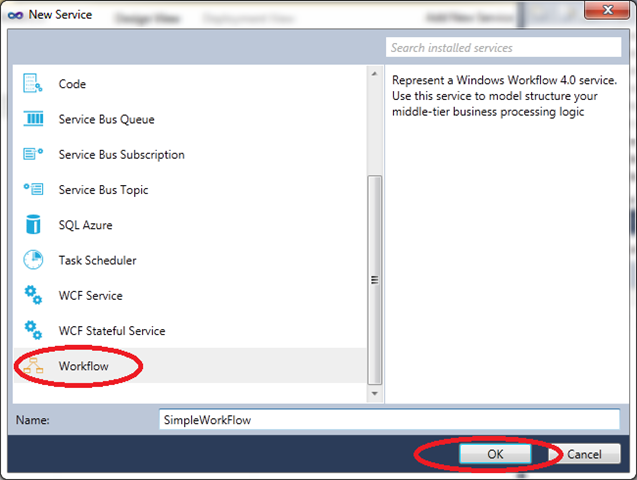 A Workflow service is a Windows Workflow 4 service. A Task Scheduler service is used to schedule tasks. A WCF Stateful service supports the creation of services which preserve instance state. To enhance scalability, WCF Stateful services support the partitioning of data and its replication across multiple instances. Furthermore, to ensure the fair allocation of resources in a multi-tenant environment WCF Stateful Services also implement the eviction of data when the 500MB limit per service is reached. The ASP.NET service is an ASP.NET (or MVC) web application. The WCF Domain Service contains the business logic for WCF RIA Services application. The WCF Service is a web-hosted WCF service. Applications are composed using more or less arbitrary mixes of these services. The services are related by adding, to an invoking service, a reference to the endpoint of another service. For example, a reference to the endpoint of a stateless WCF service could be added to an ASP.NET service. A simple application could comprise, for example, 2 instances of a Web container hosting an ASP.NET service with 1 instance of an AppFabric Container hosting a stateless WCF service. This generated file adds two methods that return a proxy object that can be used inside the service to access the stateless WCF service, as with traditional WCF programming. Note that if the service name had been changed from the default Import1 to MyWcfService, the methods would have been named CreateMyWcfService instead of CreateImport1. Both core services and referenced services are modeled so that the Visual Studio tooling can handle them. (To avoid confusion referenced services should really have been called something like external services.) This modeling provides for the capture, through a properties window, of the core properties needed to configure the referenced service. For example, for Windows Azure Blob these properties include the storage service account name and key, the container name, whether development storage should be used and whether HTTPS should be used. The modeled properties typically include a ProvisionAction and an UnprovisionAction providing information required to provision and de-provision the referenced service. For example, for a SQL Azure referenced service the ProvisionAction is either InstallIfNotExist or None while the UnprovisionAction is either DropDatabase or None. In this case, a ProvisionAction of InstallIfNotExist is invoked only if a Data Tier Applications (DAC) package is provided as an Artifact for the SQL Azure referenced service. The AppFabric Applications SDK adds Visual Studio tooling to support the visual composition of applications. As services are added to the application, the tooling ensures that the appropriate projects are created and the relevant assembly references added to them. When a service reference is added to a service, the tooling adds the relevant generated file and assembly references to the project for the service. 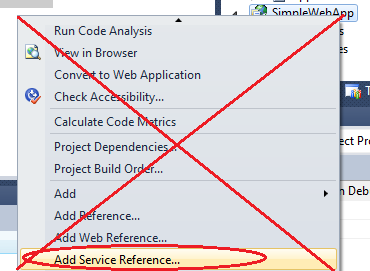 In the Design View of app.cs in Visual Studio, the services and referenced services in the application are grouped by service type. In the Deployment View, they are grouped by container (or service group). The scaleout count and the trace source level are container-level properties that can be changed in the Deployment View. They will be modifiable on the AppFabric Labs Portal, but the current CTP does not support this capability. Application services in AppFabric Containers and Stateful AppFabric Containers are then injected into these instances. Application services in a Web Container are injected into a second deployment which adds a web role instance. Note that the first deployment remains running after the application has been terminated, and is reused by subsequent deployments. However, I have run into an issue where an application containing no Web Container is not deleted after I exit the service. I have had to manually delete the deployment from the c:\af directory. 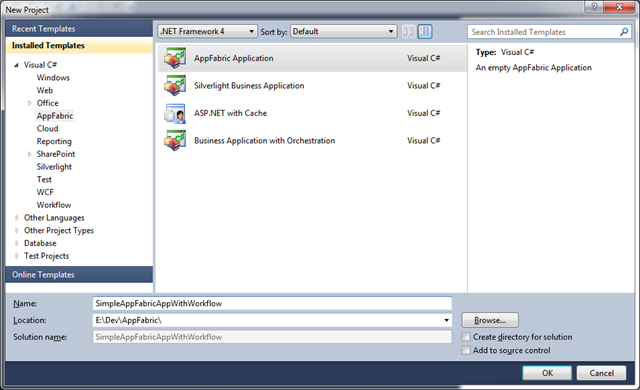 Following a deployment in the development environment, the application assemblies are located in the c:\af directory. The development environment stores various log files temporarily in files under this directory and c:\AFSdk. The latter contains directories – GW0, SF0, SF1, SL0 and SL1 – corresponding to the instances of the ContainerService deployment. Once the application terminates, these logs are persisted into AppFabric Application Container-specific blobs in Storage Emulator containers named similarly to wad-appfabric-tracing-container-36eenedmci4e3bdcpnknlhezmi, where the final string represents the specific deployment. An issue I came across was that the June CTP requires SQL Server Express. I have configured the Windows Azure Storage Emulator to use SQL Server 2008 R2. Consequently, both SQL Server Express and SQL Server 2008 R2 must be running when an application is deployed to the Compute Emulator. This is not an issue when the Storage Emulator uses SQL Server Express, which is the default for the Windows Azure SDK. The AppFabric Application Manager displays informational information about the current lifecycle state of the application, such as uploaded or started. It supports the management of that lifecycle – including the uploading of application packages, and the subsequent deployment and starting of the application. The AppFabric Manager also supports the display of application logs containing various metrics from containers, services and referenced services. For containers, these include metrics like CPU usage and network usage. The metrics include information such as ASP.NET requests and WCF call latency for services. The client-side monitoring of referenced services captures information such as SQL client execution time and Cache client get latency. The application logs can be downloaded and viewed in a trace viewer. This is all a huge improvement over the diagnostic capability exposed in the portal for classic Windows Azure. The deployment and startup of an application with three trivial Code services distributed across two containers took less than 2 minutes. The deployment and startup of the GroceryList sample application with a web site, a stateless WCF service and a SQL Azure database took 8 minutes. This speedup, over the deployment of an instance of a worker or web role in classic Windows Azure, comes from the multi-tenant nature of AppFabric Applications which deploys services into an already running instance. I am a great advocate of the PaaS model of cloud computing. I believe that AppFabric Applications represents the future of PaaS for use cases involving the composition of services that can benefit from the cost savings of running in a multi-tenanted environment. AppFabric Applications reduces the need to understand the service hosting environment allowing the focus to remain on the services. That is what PaaS is all about. As you may very well know, Windows Azure Web Role and Worker Role can have only HTTP/HTTPS/TCP type of end points. That’s means you can[‘t] use Web and Worker Role for UDP Traffic. What if you would want UDP traffic in Windows Azure? Your answer is Windows Azure VM Role & Windows Azure Connect. Windows Azure Connect provides a secure connection at IP-level, it does not have restriction for port numbers. You should check you local machine's firewall setting, making sure it allows incoming UDP traffic to reach the port the application is listening on. Using Windows Azure Connect you can allow UDP traffic from local network to the Windows Azure VM Role without any problem. Azure Connect allow UDP traffic in any direction however please make sure to configure the firewalls on any machines you want to do it on, including the Windows Azure VM Role machines as well. For example, Windows Azure VM Role with Windows Azure Connect, can be used to create a forest of Game Servers to facilitate UDP communication. In VM Role, Windows Firewall programming is depend on the user. If you are developing VM Role Image, the you should configure the firewall as you see fit for your objective. For Web and Worker role, the virtual machine is locked and endpoints are configured during VM initialization, depend on role end point configuration. So when you are using VM role you can configure Windows firewall depend on the way it is needed for your application. We are happy to announce that the new beta release of the Windows Phone SDK (renamed from 'Windows Phone Developer Tools') is available for download now. Updated Profiler. The updated profiler feature enables developers to profile performance of UI and code within an app. To use the profiler, you need to deploy and run your app on a Windows Phone device running a pre-release build of Mango – please see how to get the pre-release build of Mango below. Improved Emulator. The improved emulator provides stability and performance enhancements. Isolated Storage Explorer. The isolated storage explorer allows you to download and upload contents to/from the isolated storage of an application deployed to either the device or emulator. Advertising SDK. The Microsoft Advertising SDK is now included as part of the Windows Phone SDK. We have also updated our official documentation and introduced new educational material and code samples that provide more coverage across the platform. Check out What's New in Windows Phone Developer Tools. Download the new beta Windows Phone SDK here and please let us know what you think by providing feedback on the App Hub Forums or on our WPDev UserVoice site. You can use the SDK with Windows Phone OS 7.0 or 7.1. Start from a scenario relevant to you – mobile and Sharepoint apps, Facebook promos, Access databases, and see how cloud addresses relevant gaps. Learn about the Windows Azure Platform, an Internet-scale cloud computing and services platform hosted in Microsoft data centers. The webcast series will show you how the Windows Azure Platform provides you with a range of functionality to build applications from consumer Web to enterprise scenarios and includes an operating system with a set of developer services. The Windows Azure Platform provides a fully interoperable environment with support of industry standards and Web protocols, including REST, SOAP, and XML. Dive into these resources to learn more about how you can utilize this powerful solution to build new applications or extend existing ones. Test drive Windows Azure Platform solutions in a virtual lab. See how you can quickly and easily develop applications running in the cloud by using your existing skills with Microsoft Visual Studio and the Microsoft .NET Framework. Virtual labs are simple, with no complex setup or installation required. You get a downloadable manual for the labs and you work at your own pace, on your own schedule. This is the first uptime report for the two-Web role version of the sample project. Reports will continue on a monthly basis. A new Windows Azure end-to-end sample application that can be used locally, in Windows Azure or as a Hybrid application. If you are interested in enterprise technologies and Windows Azure I would recommend checking it out here. You can read, try it and download the source here. The title is SEO friendly as you can see . This week, while working in a cool project, we had to explore options to expose a web API and make cross domain calls from an HTML5 client. Our specific scenario is: we develop the server API and another company is building the HTML5 client. Since we are in the development phase, we wanted to be agile and work independently from each other. The fact that we are using Azure and WCF Web API is an implementation detail, this can be applied to any server side REST framework and any platform. We wanted a non-intrusive solution. This means being able to use the usual jQuery client (not learning a new client js API) and try to keep to the minimum the amount of changes in the client and server code. JSONP is an option but it does not work for POST requests. CORS is another option that I would like to try but I haven’t found a good jQuery plugin for that. The nice thing of this solution is that you can set the baseUrl to an empty string and remove the “registerOptions” and everything will keep working just fine from the same domain using the usual jQuery client. Turning on the network monitoring on IE9, we can see what is going on behind the scenes. Notice the last two calls initiated by Flash. The first one downloading the crossdomain policy file and then the actual call to the API. I uploaded the small proof of concept here. Happy Canada Day! Let’s celebrate with yet another Windows Azure developer story! A few weeks ago, I started my search for untold Canadian stories in preparation for my talk, Windows Azure: What’s In the Cloud, at Prairie Dev Con. I was just looking for a few stores, but was actually surprised, impressed, and proud of my fellow Canadians when I was able to connect with several Canadian developers who have either built new applications using Windows Azure services or have migrated existing applications to Windows Azure. What was really amazing to see was the different ways these Canadian developers were Windows Azure to create unique solutions. Back in May, we talked about leveraging Windows Azure for your next app idea, and specifically, usage scenarios around websites. We talked about how Windows Azure is ideal for sites that have to scale quickly and for sites that store massive amounts of data. Today, we’ll chat with Morton Rand-Hendriksen (@mor10) and Chris Arnold (@GoodCoffeeCode) from PhotoPivot.com and deep dive into the intricate ways they’ve used Windows Azure as a backend processing engine and mass storage platform for PhotoPivot. PhotoPivot is an early stage, self-funded start-up with the potential for internet-scale growth as a value-add to existing photo platforms by adding a DeepZoom layer to peoples' entire image collections. This, coupled with its unique front-ends, creates a great user experience. PhotoPivot experiences huge, sporadic processing burden to create this new layer and is constantly in need of vast amounts of storage. Jonathan: When you guys were designing PhotoPivot, what was the rationale behind your decision to develop for the Cloud, and more specifically, to use Windows Azure? Morten: Cloud gives us a cost-effective, zero-maintenance, highly scalable approach to hosting. It enables us to spend our valuable time focusing on our customers, not our infrastructure. Azure was the obvious choice. Between Chris and I, we’ve developed on the Microsoft stack for 2 decades and Azure's integration into our familiar IDE was important. As a BizSpark member, we also get some great, free benefits. This enabled us to get moving fast without too much concern over costs. Chris: I like integrated solutions. It means that if (when?) something in the stack I'm using goes wrong I normally have one point of contact for a fix. Using something like AWS would, potentially, put us in a position of bouncing emails back and forth between Amazon and Microsoft - not very appealing. I've also been a .NET developer since it was in Beta so using a Windows-based platform was the obvious choice. Chris: We use Windows Azure, SQL Azure, Blob Storage and CDN. Currently our infrastructure consists of an ASP.NET MVC front-end hosted in Extra Small web roles (Windows Azure Compute). We will soon be porting this to WordPress hosted on Azure. We also have a back-end process that is hosted in worker roles. These are only turned on, sporadically, when we need to process new users to the platform (and subsequently turned off when no longer needed so as to not incur costs). If we have a number of pending users we have the option to spin up as many roles as we want to pay for in order to speed up the work. We are planning to make good use of the off-peak times to spin these up - thus saving us money on data transfers in. We use SQL Azure to store all the non-binary, relational data for our users. This is potentially large (due to all the Exif data etc. associated with photography) but, thankfully, it can be massively normalised. We use Entity Framework as our logical data layer and, from this, we automatically generated the database. We use Blob storage for all of the DeepZoom binary and xml data structures. Public photos are put in public containers and can be browsed directly whilst non-public photos are stored in private containers and accessed via a web role that handles authentication and authorization. One 'interesting' aspect to this is the way we generate the DeepZoom data. The Microsoft tools are still very wedded to the filing system. This has meant us using local storage as a staging platform. Once generated, the output is uploaded to the appropriate container. We are working on writing our own DeepZoom tools that will enable us to target any Stream, not just the filing system. Our existing data centre was in the US. Because our Silverlight front-end does a lot of async streaming, users in the UK, noticed the 100ms lag. Using the CDN gives us a trivially simple way to distribute our image data and give our worldwide users a great experience. Table storage seemed the obvious choice for all our non-binary data. Using a NoSQL approach removes a layer from your stack and simplifies your application. Azure's table storage has always been touted as a fantastically cheap way to store de-normalised data. And, it is - as long as you don't need to access it frequently. We eventually changed to SQL Azure. This was, firstly, for the ability to query better and, secondly, because there's no per-transaction cost. BTW - setting up SQL Azure was blissfully simple - I never want to go back to manually setting database file locations etc! There's no debugging for deployment issues without IntelliTrace. This is OK for us as we have MSDN Ultimate through BizSpark. If you only have MSDN Professional, though, you won’t have this feature. Tracing and debugging are critical. We wrote new TraceListeners to handle Azure's scale-out abilities. Our existing back-end, pending user process, was already set up to use the standard Trace subsystems built into .NET. This easily allows us to add TraceListeners to dump info into files or to the console. There are techniques for doing this with local storage and then, periodically, shipping them to blob storage but I didn't like the approach. So, I created another Entity Data Model for the logging entities and used that to auto-generate another database. I then extended the base TraceListener class and created one that accepted the correct ObjectContext as a constructor and took care of persisting the trace events. Because the connection strings are stored in the config files this also gives us the ability to use multiple databases and infinitely scale out if required. The local emulators are pretty good, but depending on what you’re doing, there’s no guarantee that your code will work as expected in the Cloud. This can definitely slow up the development process. Best practice says to never use direct links to resources because it introduces the 'Insecure Direct Object Reference' vulnerability. In order to do avoid this, though, we would have to pay for more compute instances. Setting our blob containers to 'public' was cheaper and no security risk as they are isolated storage. Chris: Efficiency is everything. When you move from a dedicated server to Azure you have to make your storage and processes as efficient as possible, because they directly effect your bottom line. We spent time refactoring our code to 'max out' both CPU and bandwidth simultaneously. Azure can be a route to creating a profitable service, but you have to work harder to achieve this. How did we do it? Our existing back-end process (that, basically, imports new users) ran on a dedicated server. Using 'Lean Startup' principles I wrote code in a manner that allowed me to test ideas quickly. This meant that it wasn't as efficient or robust as production code. This was OK because we were paying a flat-rate for our server. Azure's pay-as-you-go model means that, if we can successfully refactor existing code so that it runs twice as fast, we'll save money. Download ALL the data for a user from Flickr. Process the data and create DeepZoom collections. Download data for ONE photo from Flickr. Process that ONE photo and create DeepZoom images. Thank you Chris and Morten. I’d like to take this opportunity to thank you for taking us on this deep dive exploring the inner workings of PhotoPivot. In Moving Your Solution to the Cloud, we talked about two types of applications – compatible with Windows Azure and designed for Windows Azure. You can consider the original dedicated server hosted version of PhotoPivot as compatible with Windows Azure. Would it work in Windows Azure if it were deployed as is? Yes, absolutely. However, as you can see above, in order to really reap the benefits of Windows Azure, Chris had to make a few changes to the application. However, once done, PhotoPivot became an application that was designed for Windows Azure, and leveraging the platform to its max to reduce costs and maximize on scale. If you’re a Flickr user, head over to photopivot.com and sign up to participate in the beta program. Once you see your pictures in these new dimensions, you’ll never want to look at them in any other way. From the photography aficionados to the average point-and-shooter, this is a great visualization tool that will give you a new way of exploring your picture collections. Check it out. You’ve probably been hearing about cloud computing. But when you get beyond the hype, most cloud solutions offer little more than an alternate place to store your data. Join us for a cloud power event, and we’ll show you how we leveraged Microsoft cloud solutions and developed a value-added Windows Azure solution for a real world business case. If you are looking to build SaaS applications or migrate existing desktop applications to Cloud. If you are looking to focus on your applications, not your infrastructure. If you are looking to leverage your existing Visual Studio and .NET, Php, Java to build compelling Cloud applications. If you are looking to adopt Cloud but confused about where to start. Bob works with Independent Software Vendors to help them realize the value of the Windows Azure Platform. Vyas helps ISVs and Enterprises adopt Microsoft Cloud Platform (Windows Azure). Here is a little tip on how to get user information from your LightSwitch application, and then use that information as a source for assigning things to users. I have an application that users sign in to view and manage tasks for the projects they are working on. The application contextually serves up data specifically for the user that is logged in. This is easily achieved by filtering the data via the query (see here for a great example of this) . Fire up LightSwitch and create a new project. I called mine LSUserLookups. Now for some fun stuff. To get at the user information in LightSwitch, we’ll create a WCF service that will query the LightSwitch application instance for the user information. Select to add a new project to the existing solution (File > Add > New Project). I named the new project LSUserLookupWCFService. Remember, we are adding a new project to the existing solution, not creating a new solution. Delete the class file (Class1.vb) that gets created automagically. Make sure that the LSUser class includes the import of the DataAnnotations namespace. This is necessary so that the “Key” attribute can be applied to a property in the class; as applied to the UserName property. The key attribute is necessary for when we add the soon to be created WCF service to our LightSwitch application. This LSUser class is going to be used for holding the user information that will be retrieved and used in the LightSwitch application. Next, we need to create the WCF service that will; make the query for user information, and then serve up the collection of user information in the form of a collection of LSUser objects. Add a Domain Service Class to the project. 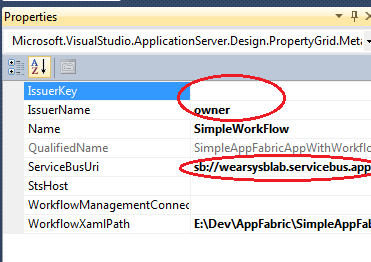 I named mine ProxySecurityDataService.vb. In the Add New Domain Service Class dialog, I unchecked the Enable client access checkbox. So what does this bad boy class do? Well, it is simply going to take the current context that it is working in, which will be the LightSwitch application, and queries the application for the users that are registered with it. It then takes the the found users and returns a enumerable list of LUser objects containing the information. All this is wrapped up in a DomainService that LightSwitch will recognize as a datasource. That’s it for the WCF service. Now back to LightSwitch. In the next dialog, which may take a few seconds, click the Add Reference button. Then use the Projects tab to add the LSUserLookupWCFService project and press OK.
After some time the wizard should present you with the WCF service class that we created earlier. Select it and click the Next button. Next, the wizard will ask you what entities to use from the service. Expand the Entities node to take a peak at what is being offered. I simply checked the Entities node to select everything (which really means just the one entity that is in there). Click the Finish button. Now LightSwitch should present you with the entity designer screen for the newly added LSUser data source. Cool beans! Now lets get crazy. I want to assign users to projects. To do this, I simply create a relationship between the LSUser entity, and the ProjectUser entity. WHOA!! Slow Down! Don’t be so impatient and start F5′ing the app to see your fabulous handy work. We need to add some users to that application so that we can actually choose from some. Open up the properties of the LightSwitch application, and configure the Access Control to User Forms authentication. Also make sure to check the Granted for debug checkbox. NOW you can launch the application (press F5). Thanks to Michael Washington (@ADefWebserver) for the heads up. With Microsoft Visual Studio LightSwitch 2011, building business applications has never been easier – and it’s launching on July 26! see: Visual Studio LightSwitch is launching July 26th! LightSwitch Concurrency Checking: One of the greatest benefits to using LightSwitch, is that it automatically manages data integrity when multiple users are updating data. It also provides a method to resolve any errors that it detects. LightSwitch–Modal Add and Edit Windows: The default Add and Edit screens generated by LightSwitch often don’t allow the control you need to meet the business requirements. Creating a Simple LightSwitch RIA Service (using POCO): WCF RIA Services are the “fix any data issue” solution. If the problem is getting data to your LightSwitch application, and the normal create or add table will not work, the answer is to use a WCF RIA Service. Saving Files To File System With LightSwitch (Uploading Files): This article describes how you can upload files using LightSwitch, and store them on the server hard drive. This is different from uploading files and storing them in the server database. If you have a Blog, Publication, Service, etc., related to LightSwitch, you are welcome to post there. You can subscribe to the forum so you will be emailed when there is a posting. This should make it easier than trying to hunt for "the latest new thing" in this forum or Twitter. In this course you will learn how to create, access and manipulate data in Visual Studio LightSwitch applications. You will also learn about the screen creation capabilities and how to create rich applications quickly. Well, this change really came in the March 2011 CTP but I didn’t realize it until the June CTP was out, so I’ll call it a wash.
WCF Data Services has had a bad problem with inherited types where the derived type had a relationship to yet another type. For example, in this model where TPTTableA is a derived type (from Base)and has related data (BaseChildren). If you expose just the Bases EntitySet (along with its derived type) in a WCF Data service, that was fine. I can browse to http://localhost:3958/WcfDataService1.svc/Bases easily. Using the same model, I can expose all of the entity sets in the data service and I’m still able to access the types in the inheritance hierarchy. Here is an example where I am looking at a single Base entity and in fact this happens to be one of the derived types, notice in the category the term is cf_model.TPTA. The type is strongly typed. That’s how the data service is able to see the relationship, only off of the specific type that owns the relationship. So accessing the relationship is a little different than normal. I struggled with this but was grateful for some help from data wizard, Pablo Castro. Note that I was still having a little trouble with the navigation (the first of these two Uris). It turns out that cassini (i.e. the asp.net Web Development Server) was having a problem with the period (.) in between cf_model and TPTA. So it’s come a long way and if this is how it is finalized, I can live with it though I guess it would be nice to have the URIs cleaned up. Of course you’re more likely to use one of the client libraries that hide much of the Uri writing from us, so maybe in the end it will not be so bad. I have not yet played with the new client library that came with this CTP so I can’t say quite yet. Ahh another one of the very awesome features of the new CTP! Pre-compiled LINQ to Entities queries (LINQ to SQL has them too) are an incredible performance boost. Entity Framework has to a bit of work to read your LINQ to Entities query, then scour through the metadata to figure out what tables & columns are involved, then pass all of that info to the provider (e.g., System.Data.SqlClient) to get a properly constructed store query. If you have queries that you use frequently, even if they have parameters, it is a big benefit to do this once and then reuse the store query. So, they’ve come up with a whole new way to pre-compile and invoke these queries and the best part is that it all happens under the covers by default. Yahoo! Plus you can easily turn the feature off (and back on) as needed. With CompiledQuery in .NET 3.5 & .NET 4.0, the cost of compiling a pre-compiling a query that can be invoked later is more expensive than the one time cost of the effort to transform a L2E query into a store query. Auto-Compiled queries work very differently so I don’t know if you need to have the same concern about turning it off for single-use queries. My educated guess is that it’s the same. EF still has to work out the query,then it has to cache it then it has to look for it in the cache. So if won’t benefit from having the store query cached, then why pay the cost of storing and reading from the cache? I highly recommend reading the EF team’s walk-through on the Auto-Compiled Queries for information on performance and more details about this feature and how it works. Especially the note that this paper says CompiledQuery is still faster. I did a small test where I ran a simple query 10 times using the default (compiled) and 10 times where I’ve turned off the compilation. I also started with a set up warmup queries to make sure that none of the queries I was timing would be impacted by EF application startup costs. Here you can see the key parts of my test. Note that I’m using ObjectContext here and that’s where the ContextOptions property lives (same options where you find LazyLoadingEnabled, etc). You can get there from an EF 4.1 DbContext by casting back to an ObjectContext. I used Visual Studio’s profiling tools to get the time taken for running the compiled queries and for running the queries with the compilation set off. When I executed each method (CompiledQueries and NonCompiledQueries) 3 times, I found that the total time for the compiled queries ran about 5 times faster than the total time for the non-compiled queries. When I executed each method 10 times, the compiled queries total time was about 3 times faster than the non-compiled. Note that these are not benchmark numbers to be used, but just a general idea of the performance savings. The performance gain from using the pre-compiling queries is not news – although again, auto-compiled queries are not as fast as invoking a CompiledQuery. What’s news is that you now get the performance savings for free. Many developers aren’t even aware of the compiled queries. Some are daunted by the code that it takes to create them. And some scenarios are just too hard or in the case of DbContext, impossible, to leverage them. I mentioned data services in the blog post title. Because this compilation is the default, that means that when you build WCF Data Services on top of an Entity Framework model, the services will also automatically get the performance savings as well. Technical support staff with years of Visual Studio LightSwitch hosting experience! DotNetPanel Control Panel - Unlimited email, databases and subdomains. A great lineup of Ignite style lightening talks at DevOps Days Mountain View 2011. While he was in Austin, I asked Damon Edwards to give us an overview of how DTO Solutions has been doing – including Run Deck – and the continuing evolution of DevOps. If you want to see the luggage we talk about in the opening, here’s a quick picture. Today, July 1, is the first day of Microsoft’s fiscal 2012 year, and is also the day that some new cloud-focused licensing changes from the company commence. License Mobility kicks in as of July 1. Server applications that can be licensed under the program include SQL Server, Exchange Server, SharePoint Server, Lync Server, System Center servers, and Dynamics CRM. Windows Server isn’t eligible for inclusion, and Windows Server operating system licenses “remain assigned to customers’ on-premises hardware with their applicable license terms,” according to Microsoft’s overview of the program. Microsoft is pitching License Mobility as making it easier for customers to move their application-server workloads from on-premises to the cloud at any time without additional licensing. For customers looking at hybrid cloud-on-premises deployments, the new terms should make life easier, Microsoft officials contend. On July 4, Microsoft’s newly updated Enterprise Agreement (EA) volume licensing terms take effect. Via the updated EA, users won’t be restricted to primarily device-based licensing terms. Instead, they’ll be able to mix and match the way they license products, with cloud-deployment being one of the options. One result will be that volume licensees won’t need to license the same functionality twice, said Mark Croft, Director of Volume Licensing Product Management. “Enterprise agreements are cloud-ready and Software Assurance supports the cloud,” said Croft. The base volume-licensing terms will remain, said Croft. There will still be device licensing, built-in Software Assurance terms, three-year contract lengths and annual reconciliation. But the changes are in recognition that “most of our (volume) customers are going to be in a hybrid environment,” Crosft said. Microsoft will likely share more details about its cloud licensing changes and how they affect its partners at its Worldwide Partner Conference the week of July 11. Added all missing video links for second day of Giga Om’s Structure Conference. CLD01 Now is the Time to Build a Successful Cloud Business in SMB! Session Details: The Cloud provides you a good opportunity to expand your business in the SMB segment. Hear about the size of the opportunity, learn how SMB businesses invest in Cloud and what they expect from partners. Plus, you will learn directly from partners on how to prioritize your investments to effectively address the needs of SMB customers. Session Details: In this session, Monitor Group will share key findings comparing on-premise and cloud economics & business models; how VARs can transition their business to the cloud; how to apply current skills and services to Cloud based offerings and the key levers to be successful. Partners will join us on stage to provide first-hand insight on how to work successfully in the Cloud. Session Details: Managed services are your key to making money in the cloud. Learn how you can support your customers in the cloud while generating an annuity revenue stream. In this session we will give you the “101” on how to build a managed-services business. The session includes strategies to enhance your success and an overview of the different managed services offerings! Session Details: The opportunities engaging with Microsoft across public and private Cloud, as well as partner and Microsoft hosted are vast. Join this session to hear the all-up public/private Cloud story which will outline the breadth and depth of opportunities the Microsoft Cloud community has to offer our partners and customers. Session Details: Join a select group of Microsoft Executives in an open forum where they will answer your questions surrounding the Cloud. Be a part of this interactive dialogue between you, fellow partners and Microsoft Executives. Take advantage of this time to share your thoughts, experiences and ideas to grow your Cloud business. Session Details: With cloud computing and Windows Azure you can expand and grow your business rapidly into new practices and solution delivery areas. Learn how you can make your cloud based practice more profitable while enhancing your value and offerings to your customers. Several of our systems integrator partners will share their first hand experiences with Windows Azure and how their customers have benefited from getting on the cloud. Session Details: Hear and meet partners who have built a successful Windows Intune practice. Partners will share how they are selling Windows Intune to customers and overcoming objections to build their Windows Intune practice. If you have been hearing about Windows Intune and thinking about how to make it real this is a great session to learn what other partners are doing. Session Details: In the competitive landscape of website development, cloud computing is revolutionizing the way you develop on the web. Join the Windows Azure team to learn how build a profitable cloud based business for your highly scalable, fast, rich web experiences. Hear directly from our partners who have launched sites on Windows Azure and how they’ve used the cloud to transform their business and pass on the benefits to their customers. Session Details: This session will provide you insights on how to transition and thrive in the Cloud. Learn how to implement scalable Cloud business and financial models which include the following key considerations: cost structures, cash flow, compensation plans, demand generation and sales processes/velocity. Session Details: Hear from a panel of top Microsoft Partners who have successfully created marketing and sales engines focused on delivering the value of Microsoft's Online Offerings. Hear tips and tricks that will get you Results! Learn how you can increase sales of online services and how to create your own marketing plans to optimize revenue. Bring questions for the panelists regarding how you can apply new ideas to energize your customer base. Session Details: Learn how to increase revenue per customer and win more deals by cross selling Microsoft Dynamics Online and O365. This session will feature various partners that successfully cross sell the two services to grow revenues, margins and profitability. CLD14 Microsoft Dynamics Cloud - What’s in it for You? Session Details: Join us to hear about how to build a thriving Cloud practice with Microsoft Dynamics CRM Online and ERP on Azure. Learn about scalable business models and effective ways to generate demand. As a bonus, partners will share their secrets to a thriving practice. Session Details: Partners have been building their cloud business with BPOS and now with Windows Intune being available you have an opportunity to expand your cloud practice and sales models to grow partner revenue streams by cross/up selling Windows Intune with BPOS and O365. Meet partners who are successful BPOS partners and now expanding their business with Windows Intune. Session Details: Come and hear directly from partners on how they have transformed themselves into successful companies with a growing Microsoft Dynamics CRM Online practice, how they overcome challenges and which key decisions lead them to success. Session Details: Understanding the Microsoft Cloud business opportunity is important, but taking an existing viable infrastructure practice and adding the Cloud without cannibalizing your company’s current revenue stream takes planning and focus. Join us and hear from a distinguished panel of technology experts who have successfully added the Cloud to their business model. You’ll hear firsthand how these partners each thought differently about their companies including certified and trained staff, the importance of Telesales and becoming a true sales organization and most important how they all made the transition while staying profitable from a pre, during and post P/L perspective. Resellers both large and small will benefit from this inside look on what it takes to go from on-premise into the Cloud. Today we take a look at the first half of 2011 to see which Cloud players are gaining mind share. In addition to the, “Top 110 Cloud Enablers Gaining Mind Share”, I have included, “The Leaderboard”, 120 Up and Coming Cloud Innovators, Movers and Shakers. So far the segment has been brimming with excitement as large enterprise information technology companies continue their rapid restructuring to an on-demand cloud computing model by enhancing their portfolios through acquisitions. Ray continues with his three lists. Box.net has launched its Box for TouchPad, which is available immediately in the HP App Catalog. In addition to offering enterprise-grade content storage and sharing to tablets, Box for TouchPad App makes available 50GB of free cloud storage for the lifetime of the account. Box for TouchPad allows users to access and view files on-the-go, easily share links to Box files and folders via email, find files quickly utilizing built-in search, and upload content directly from the TouchPad to Box.net. According to the companies, Box for TouchPad and the 50GB can be downloaded on the first TouchPad shipments by going to the HP App Catalog and searching for Box for TouchPad. The Wi-Fi version of HP TouchPad is also available in stores and online in the United States. Users have the option of buying either 16 GB or 32 GB of internal storage for $499.99 and $599.99, respectively. Currently, HP TouchPad is available in the United Kingdom, Ireland, France and Germany. It will be available in Canada on July 15, and is scheduled for launch in Australia, Hong Kong, Italy, New Zealand, Singapore and Spain later this year. It’s difficult to find a more fitting corporate name than PHP Fog. It’s cloud computing Platform-as-a-Service with a laser focus on PHP applications. The fogginess comes from the innate nature of the cloud and, more specifically, PaaS, where code enters the mist on one side and running applications emerge on the other. It’s what PHP Fog does in the foggy middle that’s so unique and garnered it a place in our second-annual LaunchPad competition. When I first covered PHP Fog in January 2011, I likened it to Heroku (a popular PaaS offering for Ruby applications), but PHP Fog might have actually surpassed its forerunner on the automation front since then. As with Heroku, PHP Fog users deploy their code to the platform using Git, at which point the automated process for scaling and other features kicks in. What PHP Fog does that’s fairly unique, though, is offer push-button deployment for specific PHP applications such as WordPress, Drupal, SugarCRM and Joomla.That capability is part a fast evolution for PHP Fog, which also already has endured its first public security breach and appears to have come out stronger in the end. Founder and CEO Lucas Carlson has hinted on several occasions that what we see today is just the beginning for PHP Fog. If the evolutionary paths of PaaS startups past is any indication, those plans might include a catalog of add-on features and support for non-PHP applications. Although PHP is the foundation of many large web sites, including Facebook, so the company has many options for new features even within PHP. PHP Fog launched in 2011 and is headquartered in Portland, Ore. It has raised $1.8 million from Madrona Venture Group, First Round Capital and Founders Co-op.